The accretion of your age is natural process that each man will face. There is nothing can avoid the aging process through the time, include for women. Long with the time passed by, the ability of your body also descent, so does your face. You'll see wrinkles and unelastic skin. Make up is the solution. How? With the right make up trick, you can cover up the sign of aging. Before you make up your face, make sure the cosmetic you use still proper to use or has not been expired yet. What you should do when you make up to make you look younger? Here are some steps you can do while you make up yourself. Before you start to make up, start it with cleaning your face with cleanser, then apply toner and moisturizer. It works to make your make up look good. Use foundation to make the color fill in perfectly on your face. Chose the color for foundation one level higher than the color of your skin. Apply concealer to disguised spot or acne scarf on the face. Concealer also use to disguised your eye bag. When you apply beauty powder, you should use brush first than use sponge to spread it homogenous. You should pick fresh and light color for the eye shadow to make you feel fresh and young. You can pick green, peach, purple or gold. To make your eyes don't look old, you shouldn't use eyeliner or if you really want to apply on, apply it thinly or you can use the pencil eyeliner. The color of the blush on should be natural such as pink or peach. Choose lipstick which had the same color with your lips or one level higher than your lips. Avoid too contrast color. You can also add lipgloss to make your lips look fresh. Straight up your eyebrow by lift the mussy brow and comb it softly. To clarify the shape of the eyebrow, you can use dark brown pencil brow, don't use the black one, coz black will make your face look old. 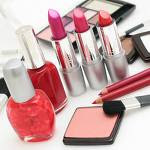 By using the appropriate cosmetics and the right trick while you make your face, you'll be look fascinating, gorgeous and pretty.